A favorite from one of the agents or their assistant invites authors to submit directly to that agent via A.M. Heath website. (Be sure to mention that the tweet was favorited in the submission letter.) And for further excitement, they will select one winning pitch per genre the week commencing September 25, 2017 to receive a critique on the selected authors first 10,000 words! Please be aware that A.M. Heath is based in London so that you pitch your genre on the correct date! Now, get those pitches ready! And don’t forget to check out the participating agents and assistants on their blog post so you don’t get scammed by trolls! As always, good luck! The Knight Agency is holding another twitter pitch event TOMORROW on April 5, 2017 from 9am-5pm EST. 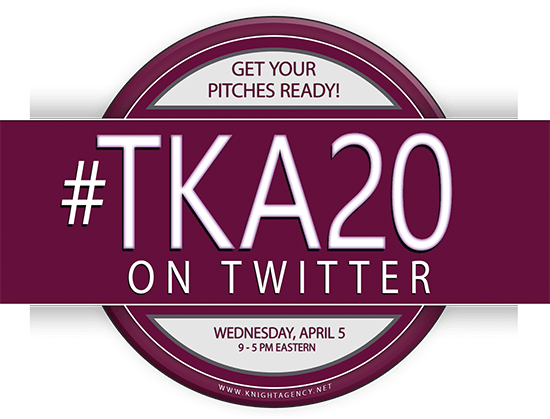 Use the hashtag #TKA20 and include your age category with genre. Do not pitch directly to the agents. Pitch the same way you’d pitch during #Pitmad and similar contests. For complete details and to see what each agent is specifically wanting, go here. As always, good luck!